There is a wide range of repositories that curate archeological collections, both material remains and associated records. While each repository is unique in its size, staff, funding, organization, and collections, there are general types of repositories with similar characteristics. The broad categories of repositories that curate archeological collections outlined below are not mutually exclusive. Many repositories fit into more than one of these categories. 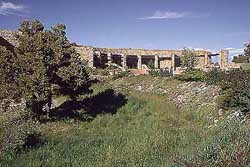 The Anasazi Heritage Center. From the photograph collection of the Bureau of Land Management, Anasazi Heritage Center, Dolores, Colorado. Museums are probably the most common type of repository. A museum can be defined as "a permanent, nonprofit organization, essentially educational and often aesthetic in purpose, which, utilizing professional staff, acquires tangible objects, interprets them, cares for them, and exhibits them to the public on a regular basis" (Malaro 1994:81). Museums are managed using public and/or private funding. Private museums usually are formed based on one person's collections or interests. Public museums are founded by federal, state, or local legislative action. Museums that house archeological collections range in size from large museums like the National Museum of Natural History, a part of the Smithsonian Institution in Washington, DC, with millions of objects and archives to local museums with just a few objects and records. The thematic nature of museums that house archeological collections is just as varied, including natural history, history, anthropology, and art museums. The common thread that sets museums apart from other types of repositories is their concentration on an educational mission usually through exhibits, public programming, and research. The mission statement, goals, and collections of a museum should reflect these foci. The emphasis on education and exhibition also means that most museums have a diversified staff with different areas of expertise. Exhibition research, design, and public programming require different training and education than collections management. Museums obtain their collections through a variety of methods. These can include: gift, bequest, purchase, field collection, and transfer from another institution. A museum's mission may not involve any active collecting after it is established, although this is rare. Use of collections can be quite varied, although it is often concentrated on exhibition and research. Other uses are educational and public programs. Academic repositories occur at a wide range of educational institutions (e.g., colleges, universities, secondary schools) and may fit into several repository types. Some are museums that are open to the public; others are primarily research institutions. The Peabody Museum of Archaeology and Ethnography at Harvard University, for example, is an academic repository with an archives that is also a public museum. The Office of Archaeological Services at the University of Alabama is an example of an academic repository that is used primarily for research. Access to the collections is provided to staff or students of the university and researchers from other institutions who go through established access procedures (see Section IX). The repository has no in-house exhibition or public spaces, although collections are made available for teaching and exhibition through a loan program. Academic repositories may obtain their collections from several sources. In some cases, the collections are primarily the result of field research by the institution's staff and students. At other repositories, the collections result from both research by university staff and compliance work by university staff, archeological consultants, and contractors. In these cases, then, many housed collections are owned by federal or state agencies and are under the contracted care of the academic repository. Because of their association with institutions of learning, a primary focus of an academic repository is education. Access and use of collections is therefore an important part of its mission and goals. Collections are often used in conjunction with classes or for faculty and student research. The associated records, key to understanding the context of recovered objects and for background research, may be held in a separate archival facility in the museum. Effective accessibility requires up-to-date collections management. This includes regular inventory, adequate research space, and adequate physical plant capabilities. Unfortunately, many academic repositories do not have adequate funds or staff for up-to-date collections management and care. Many academic archeologists who work in academic repositories do not have training in collections management and the museum personnel may not have adequate training in archeology. 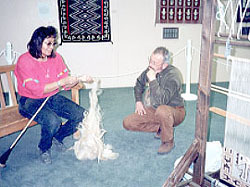 Navajo rug weaving demonstration at the Anasazi Heritage Center. From the photograph collection of the Bureau of Land Management, Anasazi Heritage Center, Dolores, Colorado. Tribal museums and cultural centers are institutions that are usually run by Native American tribes or organizations. These institutions have increased in number in recent years due, in part, to tribal concerns associated with repatriation and addressed in the Native American Graves Protection and Repatriation Act. There also has been a significant increase in tribal activity related to heritage programs, which are taking advantage of tribal archives. Tribal museums and cultural centers are unique in that they provide heritage education for tribes and employ Native Americans in presenting and caring for their own culture history. Tribal museums obtain their collections from a variety of sources, including some objects and collections repatriated under NAGPRA. These repositories have a wide variety of goals and programs, but all allow tribes to determine how they would like to use the objects, documents, and oral histories from the recent and distant past to present their culture history now and into the future. Historical societies generally range from the local to the state level, such as the Ohio Historical Society. The associated repositories usually manage and exhibit a wide variety of objects and archival holdings in their collections, which are not specifically geared to archeology or anthropology. These collections usually contain a variety of objects collected from the society's local, state, or regional geographic area. Historical societies also range widely in their organization and the variety of programs offered. Many are small-scale institutions that rely heavily on the work of volunteers and members. Some at the state level are large and now house the State Historic Preservation Officer, such as in Kansas. Historic societies may or may not have exhibit space, but usually have some form of public programming. The collections management capabilities of historical societies vary widely based on their size, staffing, and funding. A number of repositories in this country are run by state or federal government agencies. A few exist at a more local, city level, such as the small but well run repository of Alexandria Archeology in Virginia. Government agencies have increasingly become owners of archeological collections as a result of the fieldwork necessary to comply with historic preservation laws. A number of government repositories have been built strictly to care for collections resulting from this legislation. Recent data reveals that the federal government alone owns well over 60 million archeological objects and many thousands of linear feet of associated records (there are an estimated 1600 sheets of paper in a linear foot). As noted before, many government owned collections are housed in non-government repositories. As with academic repositories, there are two main types of government repositories. One is a public museum, usually including an archives and sometimes a conservation lab with an educational and public programming emphasis. These include repositories like the Arizona State Museum, Illinois State Museum, and the Maryland Archaeological Conservation Laboratory at the state level. At the federal level, a good example is the Anasazi Heritage Center of the Bureau of Land Management. This type of government repository often has the same type of staff as other museums and/or archives, including personnel who research, build exhibits, and conduct public programming. They also have good collections management programs, and space for research and collections use. Because the government owns the land on which many archeological or historic sites lie, there are also many small government museums and repositories that exist on site. This is particularly true for the National Park Service with over 300 repositories in the parks. The NPS, however, also has regional repositories that curate collections from nearby parks for fiscal efficiency, such as the Museum Resource Center, Western Archeological and Curation Center, the Midwest Archeological Center, and the Southeast Archeological Center. The other type of government repository is one without public outreach or exhibition activities. Repository staff and functions tend to be less diversified and deal almost exclusively with collections management, conservation, and researcher and culturally affiliated group access and use. 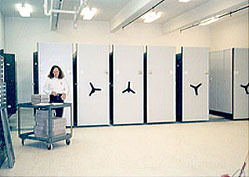 In some of these repositories, access and use may be limited or require advanced planning because items are placed in dead storage or low maintenance storage areas. Compact shelving holding associated records at the Anasazi Heritage Center. From the photograph collection of the Bureau of Land Management, Anasazi Heritage Center, Dolores, Colorado. Archives also care for archeological materials. Although an archive may house small collections of archeological objects, its primary foci are records and manuscripts. The latter may be the records associated with an archeological project, including field notes, maps, drawings, standardized forms, photographs, artifact catalogs, audio tapes, a variety of digital data, reports, and contract and other administrative material. An archives may also manage the personal papers of an archeologist, such as letters, diaries, photos, drawings, email, and draft publications. The latter often contain important historical information not found in project field records. Most often, an archives is the repository of the records of permanent value to an organization, such as all repository types presented above, and are held by that organization. However, archives also obtain collections through gift, bequest, institutional transfer, and field collection. Archeologists may or may not deposit their papers at the same repository as the collections of material remains they created, despite the important reasons to do so. The largest anthropological archives may be the National Anthropological Archives at the Smithsonian Institution. It houses over 400,000 photographs, 20,000 works of native art, and numerous audio and video recordings, along with many thousands of linear feet of documents. The typical use of an archives such as this one is for research to find evidence and information contained in the records. Some archives also have exhibit spaces and/or public programs. Archives are facing new challenges. Archeological records now often arrive as digitized photos, GIS maps, email correspondence, and sets of digital data in relational databases in a number of formats. Note that ten-twenty years ago, these records were punch cards, magcards, optical disks, 5 1/4" diskettes, and large tape reels. Archivists must deal with both preserving the information the digital data contains and making that data accessible through constant and rapid technological change. Not only do digital and magnetic records cost much more to manage than paper or film records, but their life expectancy is significantly less. Therefore, the management of digital records over time requires a significant electronic infrastructure. This includes ever changing hardware and software and a trained staff to conduct periodic digital migration, to write or update metadata, and to inspect the results. It also requires a large budget. In fact, it is currently estimated that digital files of images are approximately 10-16 times more expensive to maintain and make accessible than paper records (Puglia 1999). Archeologists add another challenge to archives by frequently producing digital data that was born digital and cannot be completely preserved over the long term on archival paper or microform. For example, a Computer-Assisted Design (CAD) model of an ancient site cannot be preserved on paper, although its many drawings can be, due to the complex relationships of its many components. Another case is a relational database for which the tables of information can be printed on paper, but the functionality of the database is lost. Finally, the tables and maps used to create GIS maps can be preserved on paper or microfilm, but the functionality of the GIS system is lost. Currently, almost no archives in the U.S. are funded at a level that allows them to effectively manage digital data over time. As a result, most repositories lose their digital data within the first thirty years of its life, particularly due to software and hardware changes and obsolescence. However, a few professional organizations are providing a digital repository to house archeological digital data and records. The Center for the Study of Architecture at Bryn Mawr College began the Archaeological Data Archive Project (ADAP) in 1993. Its primary goal is to archive digital materials from archeological projects in common formats in order to make them accessible for scholarly use over the long term. In the United Kingdom, a section of the Arts and Humanities Data Service is the Archeological Data Service, which is providing similar services. It is also publishing best practices related to digital archiving archeological materials.